If you trouble remembering what day of the week it is then consider the flight of the Balinese. According to one of the three calendars system used in Bali. A given single date on the calendar may represent ten different days of the week all at once. One of the three Balinese calendar is the standard, familiar Gregorian calendar that is in general use the word over, and use by the Indonesian Government and businesses in general. Government offices and many stores are closed on Sunday, and the important holidays of Islam, Christianity, Buddhism, and Hinduism are all celebrated. You will find such calendars in all Balinese stores and homos but, upon close inspection, you will find some differences. First of all, dates run vertically downward instead of from left to right. With Sundays on top, rather than at the left margin. And second you will find enormous amount information crowded onto each month's page, because what you are looking at is not simple Gregorian calendar it is three completely different calendars superimposed upon each other. The second calendars system is sometimes called the Javanese Balinese calendars because it had its origins in East java and was imported along with the decaying Majapahit kingdom that fled the advance of Islam in the 14th century. This wuku, or pawukon calendars flourishes in Bali, but only vestiges of it remain in java. The pawukon is a cycle of 210 days, consisting of 30 weeks, each 7 days in length. Each week has name and number, from 1 to 30, which are printed in red at the top of each column on the calendar. Most Balinese car rattles off the 30 tongue twisting week names as quickly as we can A-B-Cs. 10-55 separate week days names. Actually, however, the one-day week does not have the same name every day on some days it has no name at all. Certain of the days of the 3-day week are better than others. Pasah is bad for anything. One would never try to do anything important on Pasah. Beteng is market day. Kajeng is a very good day for many sorts of activities. The Balinese pay very special attention to dates upon which certain days of some weeks happen to coincide with certain day of other. These conjunctions are mostly confined to the 3,5 and 7 day weeks. One of the most important conjunction dates is when Kajeng. The 3rd. day of 3-day week coincides with Kliwon, the 5th. Day of the 5-day week. This day, Kajeng kliwon occurs every 3 times 5, or 15 days. It is particularly dangerous day, because evil, as well as good, spirits are at large. Everyone puts offerings on the ground in font of their homes to appease the greedy evil ones and especially at crossroads, where they are known to live. Kajeng Kliwon is also a bad day for climbing, lest one find himself in higher position than some especially holy spot, which is considered extremely dangerous and bad. But, other than that, Kajeng Kliwon is considered a generally good day. There are several important days of conjunction between days of the 5 -day week and those of the 7- day week, which occur every 35-day. One of the most interesting of these is called Tumpek. On four of the five Tumpek days of each Pawukon, special offerings and prayers are made to a particular class of everyday, useful object, as thank to god for providing them. Tumpek Landep is on Saturday of the 2nd. All Tumpeks occur on Saniscara Kliwon. On this day offering are made to sharp, iron objects such as the sacred, wavy bladed rises, and to other iron subject such as guns, and even to automobiles and motorcycles. Tumpek Uduh occurs on Saturday of the 7th. Week, Wariga, and is devoted to useful trees, especially coconut trees. In some part of Bali the trees are even dressed up in traditional Balinese clothes. Tumpek of the 17th week, Krulut involves musical instruments and dance costumes. Tumpek of the 22nd Week, Uye is called Tumpek Kandang, and offering are made to cows and pigs which are often specially decorated for the occasion. The last Tumpek of the 210-day cycle occurs on the 27th week, Wayang, and is for important Wayang Kulit puppets. Weeks number 11 and 12 of the Pawukon cycle. Dungulan and Kuningan are both-special. The 10 day between Wednesday of Dungulan which is called Galungan day, and the Saturday of Kuningan which is called kuningan day, are often referred to as the 'Galungan Days' During this period the defiled family ancestors are invited to return of their former homes and must be suitably entertained and prayed and offered to. A huge amount of work is required in making offerings. Commerce practically ceases. The market stalls are full of brightly colored rice cakes and flowers and fruits for the offerings. Schools are on vacation, and the normal life of the village concentrates upon this most important celebration. On Galungan Day everyone puts up tall. Decorated bamboo pole and shrine in front of this home. This symbolizes one of the dragon-snakes that is important in the Balinese concept of the universe. The Galungan-Kuningan period is important because it symbolize an important mythical battle between the forces of good and evil The Balinese pray that at least an equilibrium can be maintained in this strife. The 35 days following Galungan used to be a period during which it was not permitted to marry, pay debts, or buy animals but, these prohibitions are now seldom adhered to. Another important day in pawukon is the last day of the 210-day cycle. Saturday of the 30th week it is devoted to Saraswati, that manifestation of God symbolizing scholarship and learning. Offerings are made to one book, and reading is prohibited. The next for days, the beginning of week number one, are also important. They culminate on Wednesday. A day called Pagerwesi translated as iron fence. This period represent another battle between Good and Evil, and the necessity of erecting a strong spiritual barrier to keep out negative forces. The date of most temple anniversary festivals or Odalan, are set by Pawukon calendar. For example the Odalan at famous Tanah Lot temple near Tabanan is always held on Budha Langkir, that is to say. Wednesday of the 13th week but of course, this occurs every 210 days, and will not come on the same Gregorian date next time. Special events surrounding birth are governed by the Pawukon calendar. in many part of Bali a child is given a name 210 days after birth and allowed to touch the ground for the first time, in a celebration called oton. And many families celebrate the oton of family member of regularly there after. Thus, you will hear that a Balinese has a birthday every six months. This refer to practice of calling of period of five 7-day weeks a "month" when talking with foreigners. It isn't a month in our sense, but is as close as the Pawukon can come to our variable 28 to 31 day month. In addition to the ever-present Balinese paper calendar, there is another memory aid that is found in some homes and antique shops, called the tika. It is in the form of a small wooden board, about 15* 35 centimeter, but sometimes in the form of a painting on much larger cloth. The tika is divided into thirty vertical columns, representing the day of the seven -day week. Instead of number, geometric symbol -crosses, dots, circles, or diagonal, are used to represent important dates like Tumpeks, Kajeng Kliwon, Anggara - Kasih, usually painted with faces or figures symbolizing these dates. 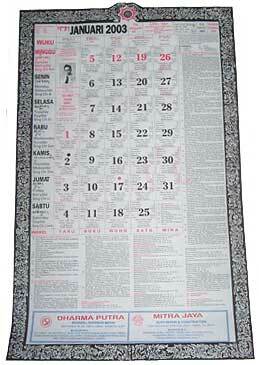 The third, and equally important, Balinese calendar system is called the Saka. Its origins are in south India where it is still in use for certain purposes. The Saka calendar is lunar. There are 12 lunar months, each ending on the date of new moon, which is called Tilem in Bali. The first 10 Month have name that are derived from the Sanskrit numbers from one to ten. The names of the last two are based upon a different system. The saka year begins on the day after the new moon that ends the ninth month, which is almost always some time in March. New year's Day, the first day of the 10th month is called Nyepi. The saka year numbering system preserves the method used in India. Its starting point commemorated the accession to the throne of the saka dynasty in 78 A.D. thus the saka year is 78 year behind the Gregorian numbering system. March 1985 will see the start of saka year 1907. The day before Nyepi that of the new moon of month number nine is always a time of exorcism. Animal sacrifices and other offering are made. The deified ancestors are invited down to earth where they reside in elaborately carved and guided statues, and these are reverently carried to the sea or to nearby holy spring to be symbolically cleansed. The evening before Nyepi everyone, especially children, bang on metal drums plates and wave flaming torches to scare away the ever- present evil spirit. Special games are played in some villages that evening. Nyepi is supposed to be a day of silence, prayer, and meditation. Each of the 12 lunar months, which are called Sasih, has 30 lunar days. Days of waxing moon, running from new moon to full moon, Purnama, are numbered from one to fifteen and are printed in red to the right of date number on the calendar. Full moon indicated by a large red dot to the left of the date. The 15 lunar day of waning moon are numbered in black at the right of the date. New moon is shown by a large black dot to the left of the date. The name of the moon is printed at the very bottom of the square for each date. Now, whenever a lunar calendar is used, problems arise. The period between successive new moons, one lunar month, contains slightly more than 291/2 solar day, not 30. But the saka calendar specifies 30 lunar day per month. If each solar day also represented a lunar day, there would, of course, have to be 30 solar days each month too, and the result will be that a new or full moon would not occur every 30 solar days, occurring about half a day sooner each month. So, after a time, the date of new or full moon on the calendar would not actually be the date upon which the moon is new or full. Such is the case in one Balinese village, Tenganan. Which makes no adjustment for this discrepancy. To bring the dates of new and full moon back to where they belong, in terms of solar day, a simple adjustment is made. Every nine weeks, 63 days, two successive days are made to fall upon one solar day. This date always a Wednesday, and you will see that two lunar days marked to right of the date are separated by a splash. This system produces a lunar month that, on the average, is less than 0.002% different than the astronomical lunar month. The other problem with lunar calendar is that they do not properly coincide with the seasons. Twelve lunar months produce a year of only 354 and 355 days. Where as our year of the seasons contain very close to 3651/4 days. So if something ware not done, Nyepi would slip backwards a long the Gregorian calendar dates 11 or 12 days a year until it no longer occurred in March. The date of the; spring Equinox. To rescue this situation, an extra, or intercalary, month is added at interval. The rule of this: new moon of the 7th. Lunar month must fall in January. But, unless something is done, this date will soon slip back into December. If this will happen in the coming year to prevent it, an extra 13th month is added before month number seven, those pushing its new moon ahead about 29 or 30 days to where it belongs. In non leap year, the intercalary month is called Sasih Mala Sadha, and is added after the 12th month. In leap year the extra month is called Sasih Mala Jiyesta, and is added after the 11th month. In these two way, therefore, the saka calendar is kept in almost perfect adjustment to the length of the Gregorian year and to the season. The Saka calendar, rather than Pawukon calendar, is used to govern the time of religious celebration in some temple and villages. Of the 66 mayor temple anniversary festival listed by the department of religion, 40 are related to the Pawukon and 26 to the saka calendar. Saka celebration usually held at full, rather than new moon, with moon number 4 and ten being especially popular. The death temple may hold their anniversaries on new moon dates. On the Balinese paper calendar there is much additional information. Below the last horizontal row, Saturday, are listed the Ingkel, for each week. Ingkel indicate a forbidden activity. During the week when Ingkel is Soto one may not cut, kill, or make offering to 4legged animal. Ingkel Mina applies the prohibition to fish. Manuk to birds, Taru to wood, and Buku to any jointed object, like bamboo. The left side below the Ingkel line show the date of especially important religious day, day of Kajeng Kliwon and so on. Below that that is a list of dates, followed by the name and location of some of the temple that will hold Odalan on each date given. The list is not complete, and some of the temples aren't even in Bali, but the list is especially useful for the self-guiding tourist. The remainder of the calendar is devoted to information that enables one to deter mine which days are suitable or unsuitable for certain activities. The Balinese consider this information to be extremely important and would never schedule an activity on a day when the calendar says that it is inappropriate. And this list covers every conceivable sort of action: planting, harvesting, cremation, starting a fire, building a house, marrying, traveling in a certain direction, selling a cow, and on and on. So, if you think that your life is complicated, just remember that what Margaret Mead aptly termed "the incredible" of Bali is very carefully controlled and regulated by a complex and interlocking set of three different calendars. One cannot really understand Bali without some comprehension of them.